Hello again! I'm back with part 2 of the Kinetics Urban Legend collection, in case you missed part 1 it can be read here. I was planning on having this post up sooner but I've been sick since Thursday :( My head feels so groggy like it's underwater and my throat has been killing me. That's one huge down fall to the seasons changing...the drastic weather changes makes it so easy to catch a cold if you're not prepared. 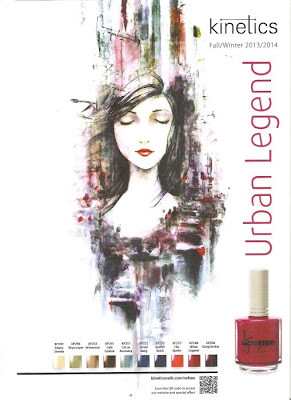 The Urban Legend Line comes "...with 10 new nail polish colors, each inspired by designers' runway fashions and reflecting life in the big city." Today I have 4 more colours from the collection, these colours are a lot more darker and intense compared to the other 4 from my previous post. Not included in my swatches are the colours Urban Legend and City Queen. Click to see and read more! Café Central is a medium coffee brown, like a milk chocolate brown. I only had to use one thick coat for opacity. 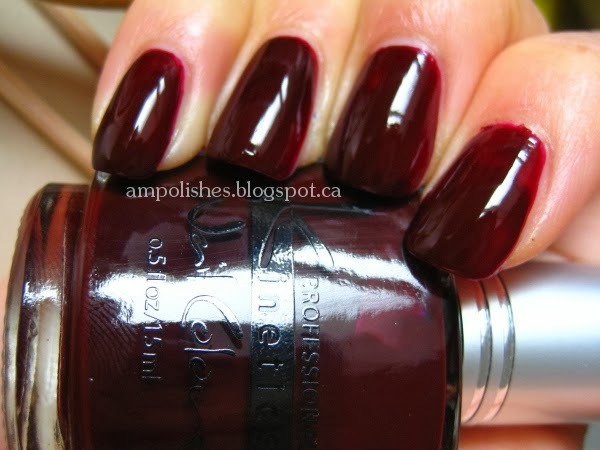 I love love love how well pigmented these polishes are. Gangserina is a deep oxblood burgundy (I kept reading this as gangsterina...like a ballerina gangster lol). I used two layers in my swatches below but looking at the swatch in the sun I should've used three for maximum coverage. Street Gang is a medium navy blue. The colour dried darker than the colour in the bottle. I only used one thick layer for opacity. 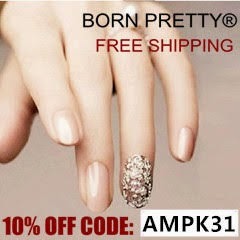 The polish applied like butter! Graffiti Quick is like Street Gang's darker older sister. It is a deep dark creme navy blue, in some lightings it looks like a bluish black. I used two layers to achieve opacity. This is the first time I've tried Kinetics nail polishes am I am absolutely smitten with the quality and application of these polishes. Some shades were 1 coaters, most were opaque with 2 layers (with the exception of Gangersina which showed some patchy spots in the sun). The colours in the collection are not too extreme or outside the box but more so sophisticated and workplace friendly. Each bottle is 15ml/ 0.5fl oz in size.